The Black Lung is a distortion that works well with rock, blues, or country, depending on the placement of your Gain knob. It has a beautiful thick, rich, and creamy sound to it, but is still ballsy enough to cut through the mix. With the Black Lung you can get that killer solo or perfect lead tone with out having to stack it with other pedals. 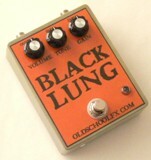 The Black Lung is very amp-like with its responsive feel and great natural sustain. Volume - Adjust to equalize your on/off sound level. Tone - Adjust to control your desired level of tone. Gain - Adjust to control the amount of gain you desire.